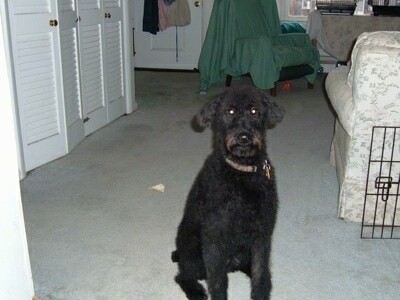 "This is our Irish Troodle (Irish Terrier / Standard Poodle) named Eve at one year old. 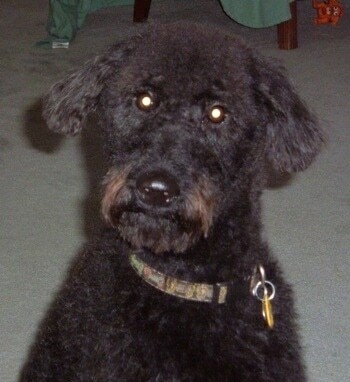 Her father is an Irish Terrier and her mother is a Standard chocolate Poodle. She’s been with us since she was 3 months old. She's black with a few strands of white mixed in with a chocolate moustache, which really shows up in the sun. She has hair that’s course like a terrier, but doesn’t shed. She gets groomed every 5 weeks. Eve’s temperament is mostly that of a terrier—loves to dig, chew, chase after anything that moves and gets easily bored. Puzzle toys help keep the mind and body active. Being part Poodle, she is very smart and figures things out fast, but again gets bored easily after mastering the lesson. She is very active and loves to run. Flyball is a great activity. It’s both physically and mentally challenging. Plus it teaches social skills. She is beginning her studies to become a therapy dog." The Irish Troodle is not a purebred dog. 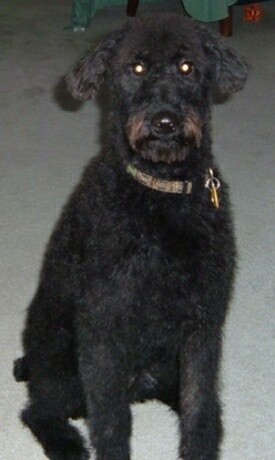 It is a cross between the Irish Terrier and the Poodle. The best way to determine the temperament of a mixed breed is to look up all breeds in the cross and know you can get any combination of any of the characteristics found in either breed. Not all of these designer hybrid dogs being bred are 50% purebred to 50% purebred. It is very common for breeders to breed multi-generation crosses.